Q. What does the attorney need? A. Every attorney is going to provide different instructions, but Collum & Perry requests a statement showing your payment and a copy of the insurance policy Declarations Page. Q. Will the insurance company cancel my policy? A. There is no law requiring that to happen and our office has never seen it happen. That does not mean, however, than an insurance company can decide that it no longer wants to issue a policy. Q. Does filing bankruptcy impact my price? A. That depends on the comapny. Most vehicle insurance policies base your cost for insurance on a separate, but related, credit score from FICO. More information about that credit score is available here, at LexisNexis. We suggest that all people, regardless of bankruptcy, call around once a year to price policies. Q. If I no longer want to keep the property, do I have to maintain the insurance? Why? A. Yes! Insuring property has nothing to do with desire to own property, but with ownership itself. As long as you own property that is either required by law to be insured (vehicles) or that could be the source of injury to someone else (real estate), you should maintain a policy. While many people file bankruptcy to dispose of houses they cannot afford and/or no longer want, it may take the bank years to go through the procedures to take possession of the property. While it can be frustrating, Collum & Perry always recommends that clients maintain insurance coverage UNTIL the property changes ownership. Q. I stopped paying insurance and the bank is now saying I owe five times as much for their policy? A. The bank has placed forced-placed a policy on you. Get your own policy ASAP! The forced-placed policy does NOT protect you from personal liability, it does not protect your possessions, and it is not for your benefit. It is solely to protect the bank’s interest. The bank will bill you for this WAY overpriced insurance and if you need the insurance, you’ll likely come up empty handed. It may seem really obvious, but when people are stressed, harassment letters like these can be quite scary! 1. Someone is on the way to arrest you right now; the police will take away your children. (This is NEVER true. The police do not arrest people for failure to pay their Discover Card bill! These threats are typically made by untraceable scammers. With that having been said, it’s important to realize that this harassment is usually a symptom of a bigger problem: your expenses are too high and your income too low. That’s the real problem, regardless of the reason (job loss, wage reduction, medical expenses, overspending, etc.). There are only two ways to stop the collections. Filing bankruptcy or successfully paying off the debt through an alternative method. Scheduling a free consultation with a qualified bankruptcy attorney will allow you to gather information to determine if bankruptcy is the right approach to stopping the harassment. IF you believe that you DO NOT owe the debt, you may have claims against the debt collectors harassing you. Contact Collum & Perry, whose aggressive attorneys will fight to defend your rights. Wage Garnishment can feel like a losing battle, but with Bankruptcy, you can get the extra help you need. Unpaid tax debt or other debt to the state of federal government. The IRS can garnish wages without first obtaining a judgment, as can the North Carolina Department of Revenue (NCDOR). Typically, garnishment happens after a number of communications in attempt to make payment arrangements, but sometimes, people just cannot afford to repay the taxes by the available options. In these instances, filing a Chapter 7 bankruptcy may permit discharge of some taxes (or other debts, freeing up income to repay the taxes) or filing a Chapter 13 bankruptcy may create a viable repayment plan. Court Ordered Child Support. Since 1988, all court orders for child support include an automatic income withholding order. The other parent can get a wage garnishment order from the court, as well (if you are behind on payments). Federal law limits what can be taken, but the limits are high (up to 50% of disposable earnings if you currently have a spouse or child you are supporting who is not the subject of the order, 60% if you aren’t supporting a spouse or child). An additional 5% may be garnished for support payments over 12 weeks in arrears. North Carolina G.S. §110-136 limits the garnishment to 40% of disposable income. While child support is never dischargeable in bankruptcy, a Chapter 13 bankruptcy may permit more affordable repayments of past due child support payments. Federal student loan debt. If student loans are in default, your wages may be garnished. Generally, student loans are not dischargeable in a bankruptcy, with few exceptions. However, a Chapter 13 will stop a garnishment for up to five years and help rearrange debt to make student loans easier to repay. Additionally, the attorneys at Collum & Perry, PLLC, are uniquely interested in Student Loan law and have a practice established to help people get out of default and into affordable repayment plans. Garnishment orders from other states. Virginia creditors often sue in Virginia Courts, get garnishment orders, and begin garnishing before anyone knows that there was an issue. Filing a Chapter 7 or Chapter 13 Bankruptcy is the easiest way to shut these down, but you may also want to speak to one of our attorneys about counter measures you can take in this type of action. If the hardest part about filing bankruptcy is deciding to file, the second most difficult part, for most people, is attending the 341 Meeting of Creditors, or First Meeting. Anxiety and nervousness is often misplaced, as the 341 Meeting is serious, but should not be frightening. The purpose of this post is to dispel some of the mystery surrounding the 341 Meeting. To get it out of the way, the name, “First Meeting” is a misnomer — there are no additional meetings. For this reason, we often just call it the 341 Meeting, as it is set pursuant to §341 of the Bankruptcy Code. The 341 Meeting typically takes place about 30 days after the case has been filed. The 341 Meeting Room is ACROSS the street from the US Bankruptcy Court & Post Office (pictured bottom right). Parking can be difficult, so arrive early. Enter in the green building (upper right) through at 402 Trade Street (left). “qualify”). However, it is as close as most clients get to “going to court.” This is because it can happen in a Courthouse (Statesville Chapter 7 341 meetings happen at the U.S. Courthouse, at 200 West Broad Street, Room 301, Statesville, NC 28677) although, they do not have to (All Chapter 13 341 Meetings take place in our office and for Charlotte Chapter 7s, in the U.S. Bankruptcy Administrator’s Office, 402 West Trade Street, Suite 205, Charlotte, NC 28202, across from the Federal Courthouse). Judges are not present. However, your Trustee will be present and your attorney will be with you. Creditors may, but very rarely do, attend the 341 Meeting. It would be extraordinarily rare (but not necessarily bad) to see a representative of Bank of America or Chase at the 341. The most common time when creditors appear is when a person has a small business and they owe another small business money. Even if they do appear, the 341 Meeting is for clarifying facts, not challenges. Did you read the petition before filing? Did you sign the petition before filing? Are the schedules and statements true and accurate? Do you have any amendments? Do you have any domestic support obligations? Have you read the Bankruptcy Information Sheet provided by the Trustee (Charlotte only)? Rather stately and recently refurbished, the Chapter 7 341 Meetings for Statesville North Carolina are held in the old U.S. Post Office Building. You will have to go through security, so remember to leave all phones and pocket knives in your car. Sometimes, if there are exposed assets because the exemptions did not protect all of a debtor’s things, the Trustee will discuss the amount of exposed equity and how to repay the creditors, although that is typically discussed between the attorney and the Trustee at a later date. 2. Listen carefully to the FULL question before answering. 3. Answer in as few words as possible. 4. Don’t explain, expand, justify or speculate unless your attorney encourages you to do so. 5. If your attorney starts talking, you stop talking. This is NOT a test or an interrogation — the purpose is to validate the information in the bankruptcy papers under oath (which should not be a problem, as the petition has been reviewed a number of times before it was filed) and to provide the Trustee with information needed to determine if the exemptions are sufficient to protect assets (which your attorney should already know before filing). Clients do not “mess everything up” at a 341 Meeting, but they do sometimes work themselves into a ball of anxiety ahead of time, and that is not necessary. In the Western District of North Carolina, 341 Meetings are typically quite short and the Trustee and your attorney exchange much of the documentation before or after the 341 Meeting. Therefore, you do not need to bring anything other than identification unless your attorney has instructed you otherwise. Finally, remember to bring identification (Drivers License is fine), leave your phone in your car (it is not allowed in Court Rooms), dress like you’re going to church, and trust that your attorney is there to help you. A bankruptcy discharge may be all that is needed to enter! released from all personal liability (responsibility) for certain types of debt. Basically, the person who files bankruptcy no longer has to pay discharged debts. At the end of a bankruptcy, the court will issue an Order discharging the debtor’s debts. This is a permanent order prohibiting creditors from taking any form of collection action on discharged debts, including filing lawsuits, sending bills, or calling the debtor. This also means that your credit report has to be updated an creditors must properly report the status of the debt. A common question is, “What debts are discharged?” The answer is that it depends. 11 U.S.C. §523 lists a number of “exceptions” to discharge, and include recent income taxes, domestic support obligations and drunk driving judgments. Some debts are dischargeable unless a creditor files a lawsuit within the bankruptcy (called an Adversary Proceeding) and proves that the debtor owes money because of his bad behavior, such as debts incurred by fraud, misrepresentation, breach of fiduciary duty, theft or willful and malicious injury. Student Loans are a special case and are only dischargeable only if the debtor files an Adversary Proceeding proving that repaying the debt imposes an undue hardship on the debtor. It is also possible that discharge can be denied completely if the person filing does something wrong, including lying on the petition, destroying records or hindering the Trustee. Remember, a discharge releases a person’s personal liability — that means that that person (as a person) is not responsible for paying the debt. However, to the extent that a debt is secured, the lien on the property securing the debt may survive a bankruptcy, depending on the type of bankruptcy filed. Certain types of debt (primarily car loans) may necessitate that you sign a reaffirmation agreement for you to retain possession of the underlying property. If you have questions about what debts are discharged, your bankruptcy attorney should be able to provide you with clear answers. 50 Cent Files Chapter 11 — Why? The reasoning has a lot to do with the idea that filing a bankruptcy is not a moral failing — it’s a legal strategy. In 50 Cent’s case, he has filed a Chapter 11 Bankruptcy. A Chapter 11 is notable in that it’s a “reorganization,” meaning that 50 Cent is NOT liquidating all of his assets and he’s not (necessarily) declaring that he has more assets than liabilities. Instead, Rapper 50 Cent is requesting the court’s intervention and assistance in restructuring his debt to provide him with more time to pay back his creditors. A quick review of the US Bankruptcy Court for the District of Connecticut’s docket for Curtis James Jackson, IIII’s bankruptcy petition shows that it was filed yesterday at 9:39 A.M. and has been assigned Case #15-21233. At this point, not much has happened, except that Lastonia Leviston filed a Motion for Relief from the Stay at 5:01 P.M. In this 8 page motion, Elizabeth J. Austin, Ms. Leviston’s attorney, requested that the Court permit a state case between Ms. Leviston and 50 Cent continue, asserting that the Chapter 11 was a “delay tactic.” According to the Motion, 50 Cent was scheduled to appear in court during the punitive damages phase of a trial in which a jury has already determined that 50 Cent intentionally caused Ms. Leviston severe emotional distress (and already been ordered to pay her $5 million in legal fees). Instead, he filed a Chapter 11 bankruptcy to “evade showing up at trial.” The hearing on the Motion is likely to be heard on July 16, 2015. 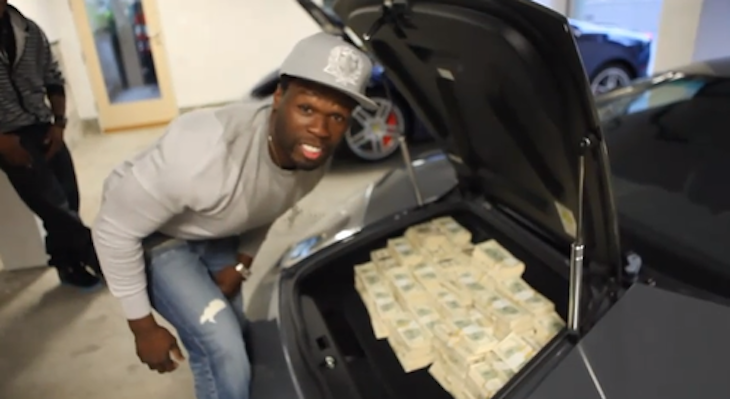 50 Cent DEFINITELY should disclose a trunk full of cash! From far away, it appears that the bankruptcy may have been filed as a way to manage a separate, unrelated lawsuit. What can the rest of us learn from Mr. Get Rich or Die Trying? 1) Bankruptcy can be a sound legal strategy. 2) Bankruptcy does not mean that all business stops. 3) Bankruptcy can buy time to continue moving forward. 4) Bankruptcy is not something to cause shame. 5) Bankruptcy can be a very smart move. No one dreams of filing bankruptcy when they grow up. It’s often seen as a last resort and, regrettably, as a failure. So many people are so avoidant to the idea of filing a bankruptcy, that they do not consider speaking to an attorney, even for a free consultation. Instead, there are many alternatives they try first, to a varying degree of success. Here, we will discuss the most common alternatives to bankruptcy that we see our clients try before they come to our office. No one ever dreams of bankruptcy. 1. Modifying a mortgage: If a mortgage payment is the source of struggles, clients often try to “work with” the bank to negotiate their mortgage into something more affordable. Modifying a mortgage is when a lender agrees to reduce the interest rate or principal, tack missed payments onto the end of the mortgage, or extend the terms of the mortgage. Many people find the modification process very frustrating because banks are slow, they lose paperwork, and there is never a clear person who can really help. Often, there is a hope that modifying a mortgage can help avoid a foreclosure, and is the first of many alternatives a person tries, but it is not uncommon that the foreclosure proceeds while the modification is stalled. 2. Asking for a Creditor’s Help: Sometimes, credit card companies provide options and plans that make it easier to pay down a debt. For example, Discover Card may lower the interest rate on a card for 8 months or AmericanExpress may freeze and account and forgive late fees as long as payments of $200.00/month are made. However, no credit card company MUST help a client and, despite the friendly face presented by many credit card companies, a credit card company exists to make money, not be a friend. Often, these assistance problems are short term and are offered to encourage people to pay that company first, allowing the helpful company to be paid while a company with higher demands is not paid. It is very rare that all creditors agree to plans that make it easier for a person to pay all of their bills. Typically, a handful of companies are helpful and all others remain steadfast, resulting in a situation that is still untenable for the unfortunate, but honest, debtor. Throwing yourself at the feet of a creditor is not typically a successful alternative to bankruptcy. 3. Draining Retirement to Pay Creditors: One of the most heartbreaking situations for our potential clients is when they have pulled out all of their retirement to pay off debts and find themselves still in a situation where they cannot pay all of their bills. Often, a medical debt comes along and a client pays it with credit cards. Unable to pay off the credit cards (because interest and fees), the client pulls all of their money out of their 401(k). In taking out their funds, they pay significant penalties, and often end up losing 30-50% before they even start paying their debt, making this one of the alternatives to bankruptcy that is particularly damaging. What is left makes a significant dent in the debt, but does not pay it all off. Three to five years later, the client has no retirement and, because of interest and fees), finds themselves in over their heads again and in our office. Even if the retirement is sufficient to pay off the debt, starting from scratch in building retirement is very difficult and the client’s retirement is no longer growing as much because the principal has been so reduced. It’s even more disheartening because the government thinks it’s so important to save for retirement that retirement accounts are completely untouchable by creditors. 4. Debt Settlement: This is one of the most common Hail Marys. They typically try this in 2 ways: through a debt settlement company OR by themselves. Debt Settlement Companies are, almost without exception, frauds, scams, and damaging to credit. So much so, that every word of this sentence links to a different resource about debt settlement companies being a scam. Not only does settling debt destroy credit, but there are huge tax consequences, risks that a creditor won’t play ball, and many other pitfalls that are important to avoid. Debt settlement companies make BIG money, which is why they spend so much as marketing themselves as THE BEST of the alternatives to bankruptcy, but they often fail to deliver on their promises. The attorneys at Collum & Perry, PLLC have experience helping some clients settle their debts, but debt settlement is done only in very specific, narrow situations. 5. Duck and Cover: Also known as turtling, many people hide from their debts. When the going gets tough, the tough become avoidant! We all know why this is not a good idea, but sometimes people easily pretend that avoiding creditors won’t increase their total debt, kill their credit, and increase their stress in the long run. 6. Buckle down and pay it off: Of all of the options, this is the most viable alternative to bankruptcy for most people. However, people still often fail. Why? Because life is expensive. If someone had to borrow money in the past, for whatever reason, it is unlikely that they will be able to avoid needing money again in the future. Paying off debt, especially large debts that are growing at 29%, can be exceedingly difficult, if not impossible. One reason to see an attorney for a free consultation is so an attorney can offer unbiased advice on whether it would be better to try to pay off the debt. It is not uncommon that Collum & Perry recommends that someone not file bankruptcy and, instead, take certain steps to pay off the debt. Before you pay anyone to help you pursue a bankruptcy alternative, please speak to an attorney about all of your options. Generally, attorneys are aware of the alternatives to bankruptcy and are happy to discuss the consequences of a variety of choices. Collum & Perry is happy to provide you with the same advice we would give our family members, honestly and clearly, so you can make the best decision.